N. eymae X veitchii "highand stripe"
N. eymae X veitchii "highland stripe"
Nepenthes eymae X veitchii is a hybrid between 2 highland parents. My clone defintely has very nice barring and is quite stunning. I've seen some other photos of this hybrid that lack the barring and have a more bronze colored peristome. So there does appear to be variation within this hybrid. I grow it as a typical highlander in full sun and it does well. The leaves of my plant are hairy and look more closely related to N. veitchii than N. eymae. Right now these pitchers appear to be lowers. As the plant matures I'm curious to see how much the N. eymae will influence this hybrid because N. eymae uppers are so different than the lowers. 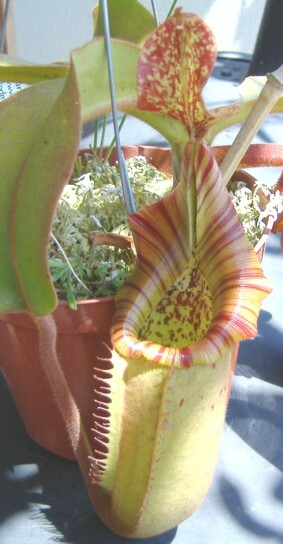 So far I haven't seen any photos of other growers' plants in the Nepenthes forums with vastly different pitchers than mine other than the peristome coloration. I think this particular hybrid is definitely worth seeking out and should retain its value for years to come.